The nib cursor, originally uploaded by dgray_xplane. I love my iPad, but the finger-only interface has been a continuing frustration for me. As an artist and designer, I want to do things that I can easily do with a pen and paper, like write, scribble and sketch. But these are not things we typically do with our fingers, any more than we eat soup or salad with our fingers. Apple apologists will say that you can sketch and write with the iPad, and indeed we can. Yes, and indeed we can also eat salad or even soup without utensils if it's absolutely necessary. But that's not ideal, is it? Over the years we've developed tools, like forks, spoons, knives and yes, pens, that make life easier. We should expect no less from our interface designers. This morning I participated in a stimulating discussion on twitter with user experience designers @docbaty, @daveixd, @mojoguzzi and @fred_beecher that left me thinking -- could we solve this problem without changing the hardware? And indeed I think we can. The problem that a pen solves (beyond carrying ink around) is that it gives the user the ability to "see where they are going." Using your finger to draw on the iPad, or even one of the many styli that are available, has the tendency to hide the point of the virtual "pen," thus hiding the path. Now imagine an interface that allows you to use the natural gesture you use to write with a pen or pencil, and gives you a point that you can see. Suddenly you can see where you are going and the primary problem is solved. One of the things that occurred to me this morning -- which led to this insight -- was that when Apple first "virtualized" the keyboard by adding it to the software interface instead of the hardware, there was a lot of initial resistance. I was one of those resisters. I couldn't imagine using a phone without a physical keyboard. But over time, I learned to use the virtual keyboard and now I appreciate the additional flexibility that this interface gives me: to have more screen or less as the case demands. 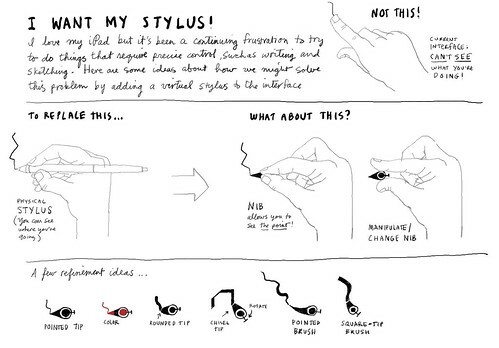 Why not do the same with the stylus? A "virtualized pen" would answer most of my gripes and over time I would probably come to love it. I might even stop carrying a pen and paper around. And that would be an interface I could fall in love with. 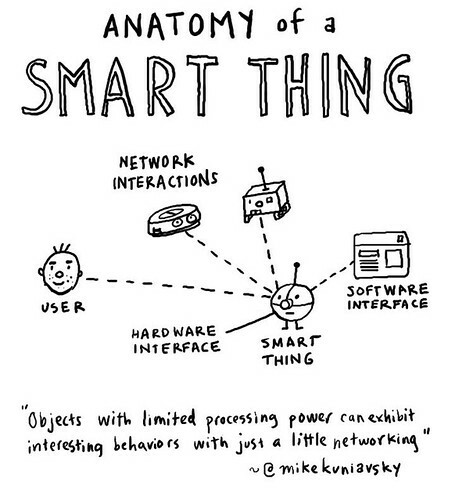 Anatomy of a smart thing, originally uploaded by dgray_xplane. "[Ubicomp is] the idea of integrating computers seamlessly into the world at large ... not simulating the world so much as enhancing the one that already exists ... [most of them] will be invisible in fact as well as in metaphor ... These machines and more will be connected in a ubiquitous network. Today's design challenge, says Kuniavsky, is to create a practice of ubiquitous computing user experience design. Such a practice is by necessity cross-disciplinary, involving identity design (what makes the product or service memorable and unique), interface design (modes of functionality), industrial design (physicality), interaction design (how you can interact with it), information design (how it displays information), service design (how the service maintains consistency across many objects devices and experiences), and information architecture (organizing principles for the information). That's a lot of D words! In other words it takes a team, and this will only increasingly be the case. The practice is changing quickly, and with the power to transform society comes great responsibility. Check out the whole set on Flickr, and please share your thoughts in the comments section! Metaphor, originally uploaded by dgray_xplane. In his book Smart Things, Mike Kuniavsky suggests metaphor as a tool for thinking through ubicomp designs and interactions. By mapping one category onto another we can discover new insights -- among other things, it's a way to trick the mind into seeing old things in new ways. Organizational metaphors (ways of organizing services) include the factory, the public utility, parallel universes and so on. 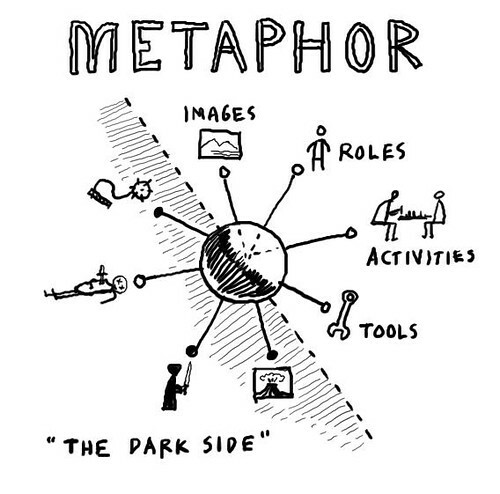 Kuniavsky suggests that when exploring a new concept via metaphor, it pays to explore the dark side as well as optimistic scenarios to get a more well-rounded picture of the future system. How might your design be thwarted? How might the system be hijacked or co-opted for other uses? Ubicomp Sketchbook, originally uploaded by dgray_xplane. 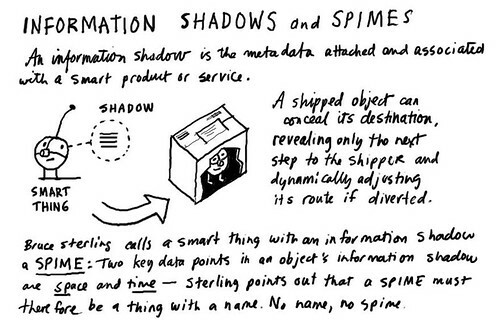 In a recent post titled Ubuquitous Service Design, Peter Morville raised some interesting questions about how we might design for a world where everything is, or potentially can be -- smart. A world where your refrigerator knows what you had for lunch and when the lettuce will be out of date. A world where your car gives you suggestions for getting better gas mileage or tells you a better way to get where you're going. In a ubicomp (ubiquitous computing) world, what kinds of methods, and what kinds of tools, will designers use to think through a whole new set of design problems? The environment and the context of use become much more important. Devices and services become stakeholders in the process, communicating not only with users but with other products and processes over a complex and deeply intertwingled network. How will this change our approaches to design and change? How will it change our lives, our cities, and our social relationships? Peter and I are embarking on a new project we're calling Ubicomp Sketchbook to explore exactly these kinds of things. We hope you will enjoy the ride and also share your thoughts, sketches and ideas. 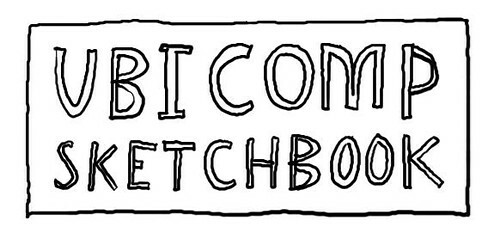 We'll be using the hashtag #ubicompsketchbook for our explorations. Nancy Duarte is the founder of Duarte Design, one of the world’s leading presentation design companies. 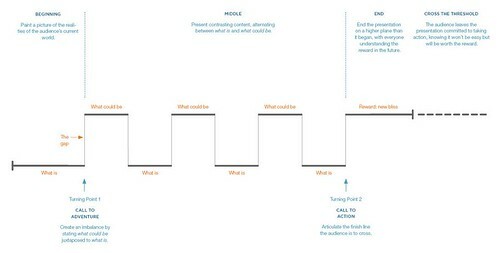 She just published a new book on storytelling for presentations, called resonate: Present Visual Stories that Transform Audiences , which follows hot on the heels of her recent book slide:ology: The Art and Science of Creating Great Presentations , a critically-acclaimed book on presentation design. I recently had a chance to do a short interview with Nancy about her new book. Q: Your recent book on presentation design, Slide:ology, was a runaway hit. What made you decide to follow that up with a book about storytelling? A: When I wrote Slide:ology, I thought that the most pressing need in business communication was the visual display of information (slides). So I wrote Slide:ology which addresses that. Once I started to see the principles applied in organizations, the slides looked great but it was really the content that was a mess. Beautiful slides created to accompany disastrous content is like dressing up a pig. My new book Resonate deals with the pig. Slide:ology was easier for me to write. It was like capturing what my organization had done for 20 years. The material easily poured from my head. With Resonate, I needed to do more homework and research. Many books exist in business around story but not as applied to a presentation. So I studied literature, cinema and even rabbit-trailed around topics like psychology, philosophy and music. After many hours of study, a great book poured out—from my heart though, not my head. Q: There’s an image in the book that resonated with me. It depicts a sailboat tacking into the wind, an image that represents the presenter’s challenge to move their ideas against the prevailing status quo. What’s the story behind this image? Can you remember how you came up with the idea? I’d always envisioned the sparkline as moving back and forth as a zig zag but it was confusing so I changed the sparkline to pumpkin-tooth shaped, so the sailboat had to be used for a different metaphor. One of the guys on my content team tied in the concept of wind resistance as a parallel for audience resistance. Interestingly, when a sailboat is sailing against the wind, if the sails are set correctly to capture the wind resistance, a physics phenomenon happens and the boat can sail faster than the wind itself. 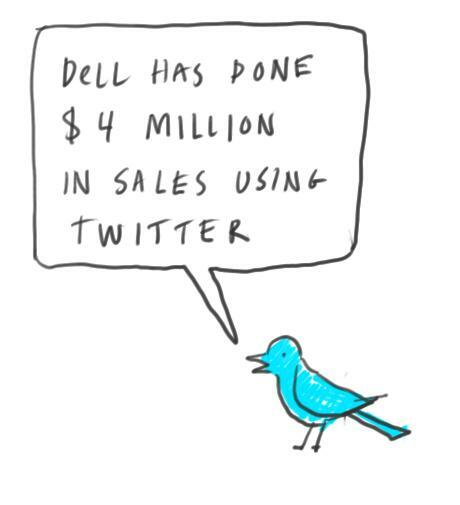 That can happen with a presentation. Insert the ways your audience might resist and you’ll get them to adopt your side quicker. Q: You describe the book as, at least in part, a research project. What process did you follow when writing the book? How did it work for you? Would you do it the same way next time? I built the first pass of the outline in PowerPoint. Each spread of the book has one title (message) and supporting text and graphics. Similar to a slide. So I print and re-print my deck. Posted, rearranged and re-posted it on my wall until the structure was sound. It was just like how we used 3x5 cards to write papers in college. I enjoyed my creative process. Many people thought it looked chaotic but I had a blast. I would definitely use the same creative process. Q: You talk a lot about the presenter as mentor, like Yoda or Mr. Miyagi from the Karate Kid, the “guide on the side” who helps audiences come to conclusions on their own. Yet presenters often are expected to take the role of “sage on the stage,” the center of attention. It’s hard to picture Yoda or Mr. Miyagi on stage giving a dramatic presentation. How do you suggest that presenters can reconcile these two, seemingly contradictory, ideas? A: That’s a good insight, Dave. The reference to mentor doesn’t dictate that they are low energy and are boring on the stage. I’m trying to get presenters to take on a change in mindset and a new stance in their role. The audience determines whether your idea is successful and applied, so they are the hero of your idea. The role of the mentor in movies and mythology is to bring a magical gift, tool or ability to get the hero unstuck. When was the last time you sat through a presentation and felt you received any of that? Besides, if Yoda needed to deliver a formal presentation he would be awe-inspiring I’m sure. 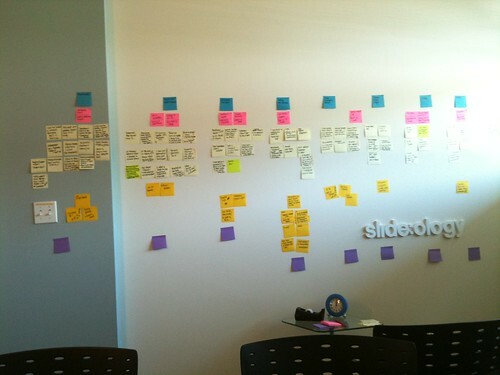 Q: You spend a lot of time talking about using sticky notes to map out presentations. Why do you think this is important? A: Sticky notes work great for generating ideas, filtering them down and then arranging and rearranging them until the concept and structure are sound. Great structure plays a critical role in how digestible and insightful your findings are. Q: Design geek question: Both Slide:ology and Resonate are large-format books packed with full-color images. And they’re square in shape! You don’t see square books very often. What made you choose this particular design for your books? 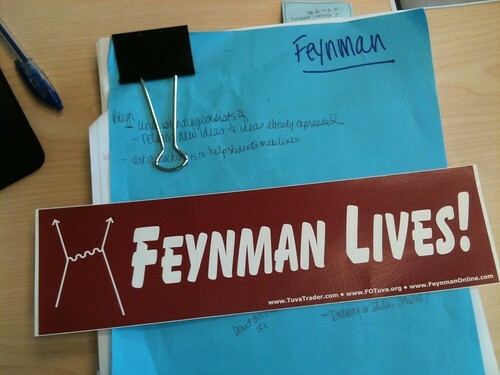 A: I envisioned both my books as reference books that people would want to lay open on their desk. Traditional 5x7 books don’t lay flat like that. Since I work in presentations all day, the open spread of the square books feels more similar to a slide-format and I’m stuck in a groove of writing one complete thought per page. The down-side of the wider format is that airport bookstores are hesitant to carry the book because it takes up too much shelf space. Bummer. Q: Has your book-writing journey resulted in any learning that changed the way you approach your work? If so, what did you learn and how has it changed your work? A: If you had told me three years ago that I would write books and enjoy it, I would laughed and called you crazy. Getting a book done (especially a visual book) takes determination and commitment. So it takes a fire in your belly and daily (and nightly and weekendly) discipline to complete a book. I discovered a few things about myself along the way. I found my writing sweet-spot. I always thought I was a night person, but come to find out I get my best work done between 5 a.m. and noon. Now I block every morning to get my brain-work done. In addition to a new way of working, I also discovered that I’m a systems thinker. I get pretty energized when I find patterns and connections that no one has seen before. Q: If there’s one thing you hope people will take away from Resonate, what would that be? A: I think that everyone is capable of changing the world (maybe not the entire world but at least their own world). Some of the greatest ideas have remained concealed because someone wasn’t brave enough or committed enough to communicate it well. I’m hoping that Resonate gives them a new mindset and guidance to communicate their ideas well so they’re adopted and make the world a better place. If you want to buy either book I've made handy links for you right here. Highly recommended! If you would like to see more interviews like this please leave a comment and let me know. Thanks! Dave Gray-Knowledge Games: A Grammar for Creativity and Innovation from Interaction Design Association on Vimeo.